The perfect size case for a moderate amount of memorabilia. This case is available in either Red Oak, Walnut or Cherry and comes with a red, black, blue or green backround. 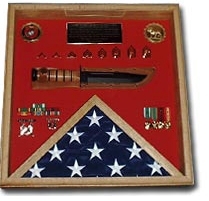 Outside dimensions are 18"x 18"
Orders for the Flag and a knife display case are usually shipped out within one business day to places within the USA and Canada.